A recent post, on the subject of outlines in paintings by my friend Alissa, got me to thinking about lines. I would regard a line in my painting the same way a carpenter does a line on a piece of wood, before he applies the saw – it defines a boundary which is destroyed in the subsequent process. But this is not the form of the line Alissa is talking about. Its the outline which some artists have on objects in representational paintings. 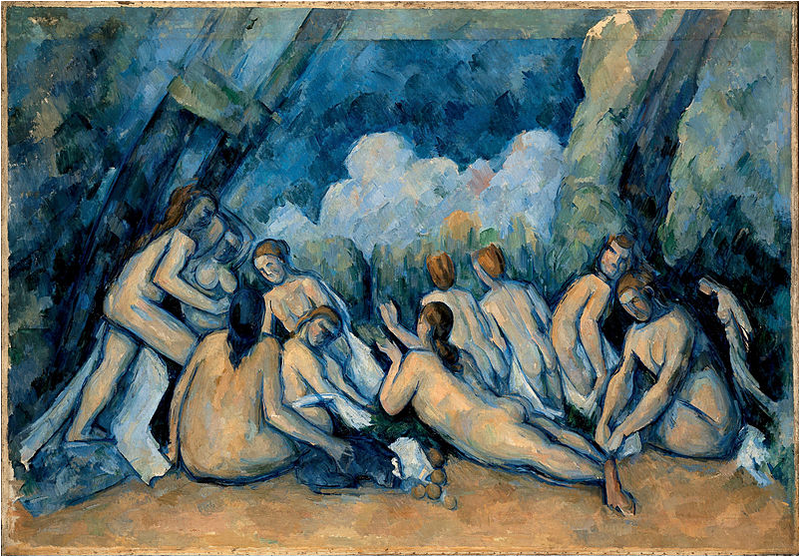 The paintings of Monet and Cezanne illustrates the difference, even though they were both members of the same Impressionist movement in art. Alissa was disturbed by the lack of lines in a drawing which was created by form only. I strive to remove lines from paintings and would never be happy with a sketch composed of outlines, although I appreciate this in other artists work. To me, a line defines the difference between what we see (no outlines) as opposed to what we know to be there. Think of Google Maps – the Satellite view as opposed to the Map view. You choose what you are comfortable with. The presence of an outline in a painting immediately defines the ‘type’ of representational art it is. Are you happy to be told what this shape is or do you want to guess at it and form your own conclusions. There are probably deep physiological reasons why we chose one form or the other. My personal view is that representational painting occupies a position on the artistic spectrum, somewhere between poetry and music. A painting with lines and defined objects is poetic, it has definite statements. 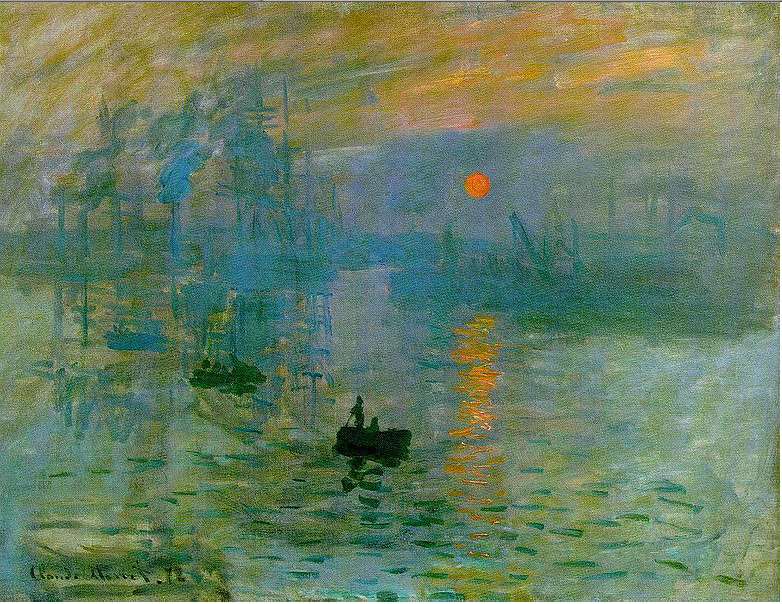 A painting, especially an impressionist work, is like music. Individual notes of colour, when heard (or seen) are just blobs but heard (or seen) together form a melody. The melody does not make statements it evokes memories, emotions – its liked or disliked, we can’t say why. OK, enough talk, back to the painting! This painting is on a piece of linen canvas. I prepared the surface about 30 years ago and primed with a mid grey. The surface is very rough even though the weave is fine. A texture like sand paper. At that time I prepared 10×10 foot pieces on a stretcher of that size and later cut it up to stretch on smaller stretcher pieces. It was a time consuming job but, at that time, well worth the effort as commercially prepared canvas was very costly. This surface is very different to what I use at the moment. I’m not impressed by the rough texture of this canvas and had to adjust the style of painting to accommodate it. In a way its easier to use, as the surface absorbs the paint and several brush strokes are required to actually paint a item in the picture. There is plenty of scope to correct a miss-placed brush stroke. 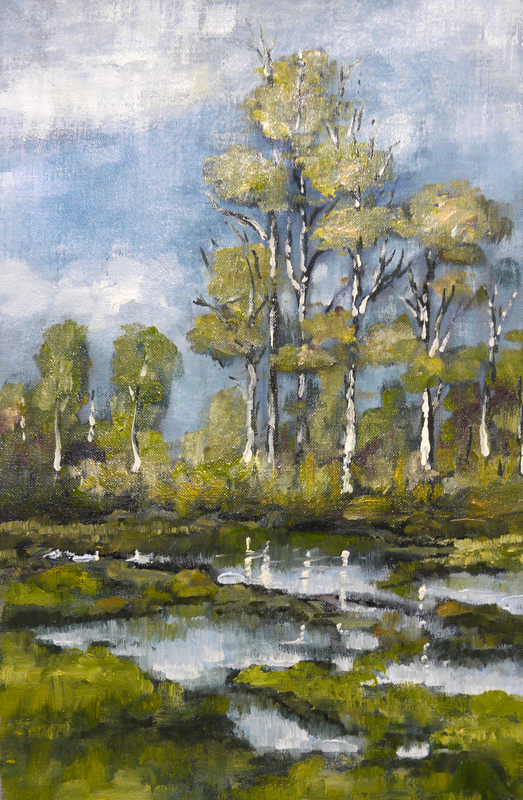 Birch trees are a feature of bogland, and there is plenty in County Kildare where I live. They are creepy places steeped in history and folklore. Only recently another ‘bog body‘ was found which is believed to be 3000 years old. Human sacrifice or execution, no one knows for sure. Boglands are wet absorbent places, with their own eco-system. All is enveloped and does not decay so there are no nutrients in the lower layers – ideal for shallow rooted birches. A video of the painting process will be posted whenever my computer returns, hopefully in working order. Did you know there is an application for WordPress for the iPhone? Without my laptop I’ve been ‘playing’ with other gadgets. A post can be written, including photographs, and published from the phone from anywhere. Mad stuff, worth further investigation. My computer is important to me. Photos, videos, all sorts of things are accumulating in the computer at a steady pace. The hard drive (500GB) of my new laptop (5 months old) filled up and I was reminded of this, by the system. So I bought a new backup drive, the old one was not big enough for the new computer. As I was preparing to backup (Time Machine on my Mac) I noticed a little warning in the disk utility that the ‘S.M.A.R.T. status’ reported the disk was failing. 5 months old and failing? Couldn’t be. To make a long story short, I did the backup yesterday and the computer collapsed today. The hard drive has a terminal failure, that means completely dead and the data practically unrecoverable. I think that is what you call ‘dodging the bullet’. A computer ‘nerd’ friend said ‘its not will your hard drive fail, its when’. Ahh! I am now using my ‘old laptop’ again (commandeered from my son) and missing all the cool stuff the new one could do. 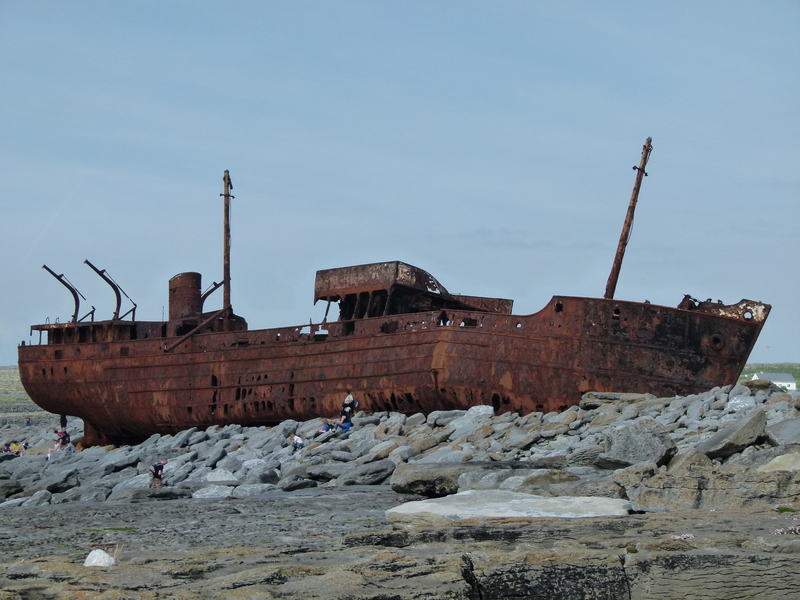 I’ve no access to my picture collection so I included one of his, ‘The Wreck of the Plassey on Inis Oirr‘. Appropriate? Yes. The moral of the story is this – backup your computer. Luckily, Apple Macs have a very user friendly way of doing it (mentioned above) and I got it done without much hassle. I would have lost everything I accumulated over the last 5 months. I know people who have a computer for years and have never backed it up. There is going to be a catastrophic loss of personal data over the coming years, especially photos. There are plans, ‘in the pipeline’, to offer computer users an ‘online’ backup service, if you happen to be ‘online’. There are expensive and limited systems available at the moment (Flickr for photos, for example). I really enjoyed painting this picture. 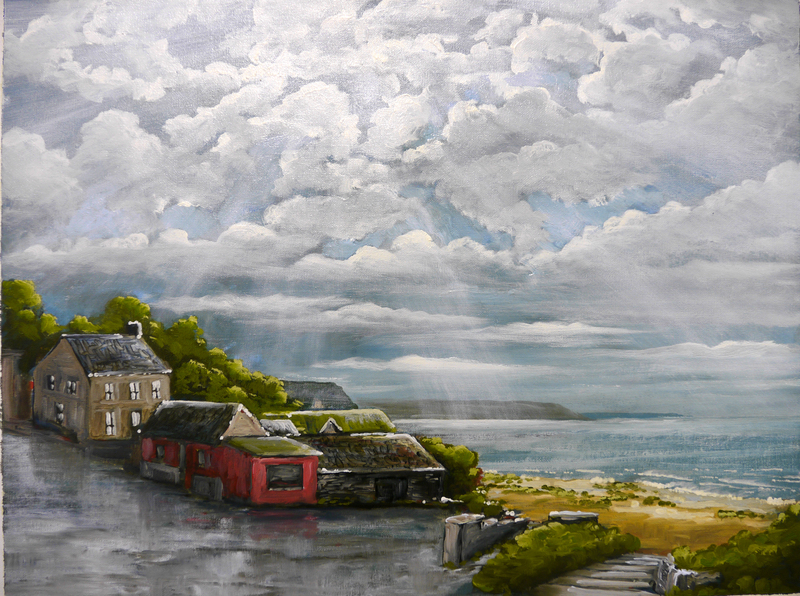 The only part which was required to resemble a ‘real’ scene was the little island on the horizon – Skellig Michael. 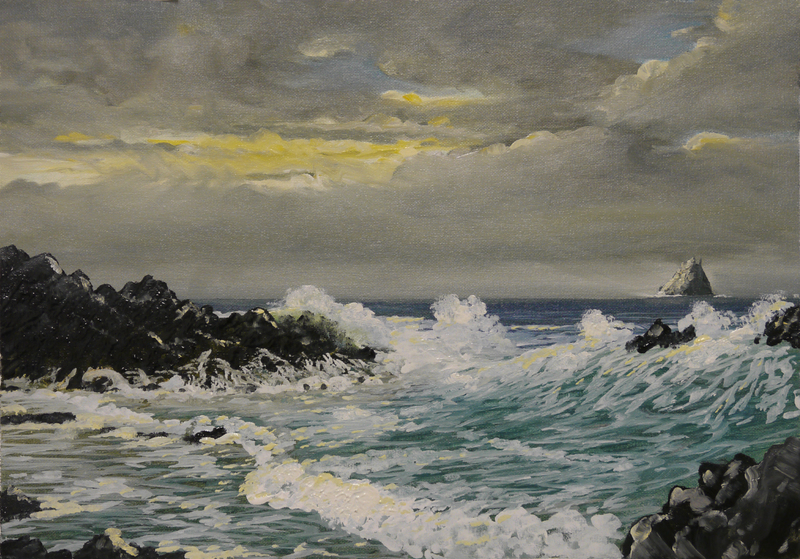 The rest was a conglomeration of elements from the coast of West Kerry and this makes for an enjoyable painting. In the normal course of events, the island should be on the one third line – to have a pleasing composition. In fact it was there in the original sketch and I moved it as the sketch was developed. Maybe it was because life on the island was anything but comfortable or maybe to balance the action on the left hand side, it just seemed right to be out of the norm. It is possible to ‘over think’ a situation. Much of the white paint was added as pure white. Because the under layers were wet, the white was tinted with whatever was already there. The more the area is worked, the more the white is tinted. This is a technique I also use for snowscapes. One more point which I notice from the video and I do without thinking. When a colour is introduced into the painting for the first time, as the Cadmium Yellow of the sunlight, to maintain harmony within the painting this colour is then dotted around the rest of the painting. Not only where it is required, as reflected light on the wave, but blended into colours already in-situ. I always try and have all colours dispersed in every area of the painting, especially landscapes. Example, the blue used in the sky is the same blue used in shadows and greens on the ground part of the painting. In the above painting, the sunset yellow was an after-thought, and the yellow used is so distinctive it would be an ‘alien’ element in the painting. Another way to harmonise colours is to use the same brush in different areas of the painting without thoroughly cleaning the brush between colours, if you know what I mean – the green used (Viridian) in the sea was left on the brush when I started to paint in the clouds of the sky. I was thinking I might add some ‘final touches’ after the painting dries, but now I’m not so sure. The one session (alla prima) look of the painting is so fresh and honest, mistakes and all, I think I will leave it for a while. This ‘quick painting’ was a welcome relief from the previous painting. I was planning to do a 1 hour painting but forgot that the slightly larger size (20″x14″) just eats up the time and it took 2 hours. But a nice change to have a painting complete (well almost) in 1 session. I got to thinking about the limitations of ‘alla prima’ especially painting on top of wet paint. One time I would use solvent only in the initial layers which would evaporate leaving a very thin layer of paint, easier to paint over. Now I mix Liquin, with very little solvent, with the paint and brush the layer vigorously. This makes the layer tacky and easier to draw with the brush on top. A little planning in advance to work out the areas to apply the initial layer is helpful. This will be seen in the video which I will be posting in the near future. All that remains to be done with this painting is a little ‘glazing’ on top of the foreground water to deepen the colour and make it richer in colour. A little work on the ‘shape’ of Skellig Michael, that’s the little island on the horizon, to make it more recognisable. By the way, the foam left after a wave, behaves like the suds on top of a basin of soapy water. It disperses in circles surrounded by lines of foam. (If you want to check this out, be careful to do so in private, as staring into a basin of dirty washing up water is not good for the ‘arty’ image). Ahem!, just thought I’d mention that, anyway the glazing will re-establish this pattern of circles. I hope to have the time lapse video ready for the next post. The painting was completed in 3 stages. Each dried before the next was started. There are advantages and, of course, disadvantages in this approach. I do it as a change from my 1 hour paintings which I happen to prefer. This ‘quick painting’ creates an intense involvement with the process. Every brushstroke is critical. Because I use a computer to produce graphics for my ‘day job’, remembering that I don’t have an ‘undo’ key adds to the excitement of this type of painting. In a way its like a live performance. But this post is not about ‘quick painting’. Its about the 4 hours, 3 stage painting. For a beginner, this is a safe option. In a sense, you have an ‘undo’ key. If the under layer is dry, a misplaced brushstroke can be removed with a little solvent on a tissue paper. Before the next stage is started its a good idea to ‘wet’ the entire surface with a medium like ‘Liquin’. The drying process changes the colours, especially the dark ones. They appear lighter in colour. The oily effect returns the painting to look as it did when you last worked on it. There are effects (see in the above video) like the rays of light which would be difficult in the ‘alla prima‘ method. Also, large paintings, even with large brushes, take so much time, can only be done in stages. A serious defect with the multi-stage painting is the tendency to overwork the painting. Trying to maintain a freshness and the ‘hand of the artist’ in the work which has several reworks, is difficult. But, for a beginner, it is still a more comfortable approach. I think in due course and with experience, a beginner will be drawn to the thrill of alla prima. An interesting observation:- As a holding medium of videos for this blog I use YouTube. These are public and watched by a broad spectrum of people. Some, like myself, are interested in the ‘nuts and bolts’ of producing a painting without all the ‘waffle’. Others are random hits. The most watched, and the one which engages the viewer the longest, of my 20 or so videos is Still Life with Two Glasses. Alla prima at its most difficult – transparent glass on an almost black wet-paint background. Are we witnessing a new art form emerging as a result of the ‘web’. A ‘doing’ and ‘sharing’ form of performance. Who knows?